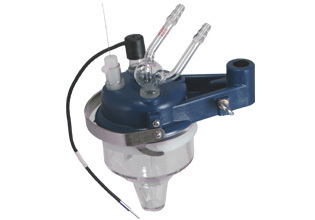 The Model RDE0018 Analytical cell kit is designed for use with rotating disk and ring-disk electrodes. The kit contains two cell tops, RDE0010 and K0066. The RDE0010 cell top has five holes, four 14/20 standard taper ports to accept reference and counter electrodes, purge tube, etc and one slightly larger hole to accommodate the arbor from the rotating disk electrode. The K0066 cell top has five 14/20 standard taper ports that allow the cell to be used for standard electrochemical applications, where a rotator is not used. Incorporates a 14/20 standard taper joint to fit K0066 or RDE0010 cell tops. A two-way Teflon stopcock directs inert gas stream through the analyte solution for displacement of dissolved oxygen or over solution to form inert gas blanket. Only the flexible Teflon tubing contacts the solution. A kit for polishing graphite or cleaning glassy carbon electrodes. Complete with polishing cloth, 0.5 µm alumina and wash bottle. 2 mL minimum volume. Working volume of 2 - 50 mL. A water jacketed version of the K0060 Cell Bottom suitable for connection to constant temperature circulators. Working volume of 5 - 50 mL. Provides isolation of the K0077 or G0093 reference electrode from test solution to prevent contamination of test solution by reference electrode filling solution. Incorporates a Porous Glass frit, making it ideal in situations where leakage of the test solution must be kept to an absolute minimum with minimal electrical resistance. The K0065 comes complete and ready to use immediately. Five replacement Porous Glass frits and five lengths of Teflon heat-shrink tubing are also supplied. This reference electrode is identical in physical configuration to the K0077 Reference Electrode except the G0093 contains a mercury-mercurous sulfate inner element immersed in a saturated potassium sulfate solution. The electrode is employed in situations in which the use of a saturated calomel electrode would be unsatisfactory, for example, chloride analysis, silver analysis, etc. Incorporates a T14/20 standard taper joint for use with the K0065 reference electrode bridge tube. Inner element is a silver wire immersed in acetonitrile containing 0.1M AgNO3. This electrode is employed in applications involving non-aqueous supporting electrolytes such as benzene-methanol, acetonitrile and DMF. Incorporates a 4 mm Porous Glass frit at the tip. A solution of 0.1M AgNO3 in Acetonitrile for use with the K0103 reference electrode. 125 mL.